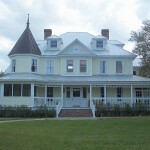 Townsend Plantation was built by the Eldredge family in 1903. The McBride family purchased it in the 1940s. After the owner died in 1978, it remained empty for several years. In the 1980s it was purchased by the Townsend family. They moved the house, the other plantation buildings, and even most of the live oaks to their current location in 1985, and renovated the buildings. After a short time it became empty again. This location has transferred hands numerous times over the past few decades. It was Townshend’s Plantation only until 1997, when a surf-and-turf restaurant called “Captain and the Cowboy” opened there (it lasted only until 2005). It is now a wedding event location called Highland Manor. Supposedly strange sounds are heard in the attic, and a mysterious ghost-like presence is known to rub against visitors. After constructing and opening a haunted house for Halloween, My wife and I were given permission to stay in the manor. During the tours of the home, many of my volunteer scar actors claimed to have been touched, heard noises and voices. No one was allowed on the third floor at all. Other then my wife and I. We slept up there and had many paranormal experiences. This manor is full of paranormal activity. Nothing dangerous, but the Dr. and his wife will definitely let you know that it is their home!! I would love the opportunity to investigate the manor again! Call Dubsdread Catering, I think that they can help you. 407-809-5740. They have a sign out on the property for catering weddings there. Went to a wedding there a year ago and I was in the bathroom and there was another lady in there with me and we both felt a cold air blow by us but we both just thought it was the air kicking on.Then later I went on your web site and read how the house was hunted.But I guess it was a friendly ghost. Trust me, that was not a friendly ghost…. I had dinner at the Captain and the Cowboy several years ago. As my family sat at the table everything seemed fine. It was not until I went outside and was just looking around the home that I was drawn to staring at this window on the second or third floor. I felt someone was watching me. After dinner we were given a tour by a person that worked there. As soon as I touched the banister I got a very bad feeling. I really did not want to go up the stairs but I felt compelled to do so. It was not until we reached the second floor that the employee told us of the doctor and his wife and what had happened there. I instantly got very cold and so did my son, but no one else in my family felt anything. I can see orbs without using a camera to see one. I have been told I am what they call a “sensitive”. Given this I picked up on a lot of coldness, shivering and it did not stop. I felt the doctors anger and he wanted everyone out of his home. I had never experienced such a drastic change in temp. I would like to go back with a spirit box that gives off white noise so you can pick up what the paranormal may want to say. I do feel a great deal of anger there. I am not sure how safe it is. The doctor lost his wife because he thought she was cheating on him with the Gardener. That was not the case. The doctor killed the Gardener, which devistated the doctors wife. She then killed herself. I want not recommend having a wedding there. Way to much negative energy!! First of all there was no gardner and the doctor didn’t kill anyone—I have gotten history from people in the area. The wife was a pilot (think time line for Amelia Erhart–I looked her up and she’s in the books) The doctor was much older and she apparently took lovers and for some reason (that’s a little vague) and was tried, but in backwoods Fl. the only doctor had some pulled and they let her have house arrest. She stayed upstairs on the third floor after thing had quieted down she was allowed a little more freedom and she died (of unknown cause) shortly thereafter. It is her and her lover who is suppose to haunt the place and let me tell you there have been two incidents where there was apparent possession for a short period of time (a manager of Townsend’s told me about a waitress and an organization that does psychic investigation about a psychic that was touring the house with them. I went there with my sister who has been “talented” since he was four or 5 and she says she has never seen any spirit that is that angry. She described how the the woman had died and I’m a nurse and it could be that the good doctor killed her. But where the staff came it with a gardener is beyond me. 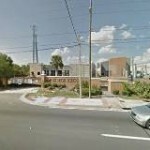 For years it was the Main Doctor /Hospital in Apopka so there is bound to be some residual energy left in the building, even though the house has been moved several blocks from its original site on North Highland ave. Where the dog park is now. During the time of the Townsend Plantation, there was a restaurant and museum to the Eldridge family. On the walls there was original photos and the rooms on the second and 3rd floor were fully furnished as they would have been when the family lived there. As soon as you get to the second floor landing the first door to your right was the childrens playroom and you could hear childrens laughter and the rocking horse inside would move like someone was riding it, I saw it myself. A pull toy that was a wooden duck moved across the floor by itself. the room on the left at the front end of the building on the second floor was a den of some kind and it had a woman in 1900 period white dress siting in a chair by the window. I ran down the stairs and forced my date to leave the restaurant. My wife was the GM and I was a bartender. We were the ones who got the phone calls in the middle of the night when the alarms were tripped and it happened all the time. We would drive down to meet an officer and check the place out and there was never a break in. The AC would be shut off at night to save electricity and it would be ICE cold. You could feel the presence of something in that place, I never saw her but the place is definitely haunted. Before the house was moved to it’s current location it was simply called “Doc Tommy’s house” and my family lived very close. I was an infant then but my Mother and Father (Both skeptics by nature.) told me stories of how haunted the place really was. Lights at night, figures passing by windows and female screams. This was all in the early 80’s. My husband is a FF/Paramedic in the area. They get calls there all the time in the middle of the night for alarms. No one is ever there and yes it is cold inside! We have been there multiple times for dinners and drinks when it was the restaurant and numerous strange things happened. One of the formal dinners we went to there several of us went upstairs (further than we should have) and heard, felt and saw things. Nothing was ever mean spirited, just spooky! I was a waitress there when It was Townsends Plantation. I hated working on the 2nd floor, especially if I was the last server working. It was always cold. I don’t know how to describe what it was except that it was an ominous force that I would want to run from. I could feel it on the back of my neck until I got down the stairs. They would only have male servers work the 3rd floor (thank God) because it was the creepiest of all. I was never there alone. Several of the servers took a Ougi board one night but I spent enough time there to know that it was not a friendly entity and no good would come from trying to interact. I had a friend that use to take care of the grounds yard keeping & landscaping at the location the home is in now and he would cut the grass early in the mornings sometimes start before the sun was up with lights on mowers they would have issue with equipment and as they would be ridding around the home on lawn mower they said there was always a heavy tension and out of corner of eye you felt like you could see something follow you around from window to window from one side of home to other and watching you. He said that the minute his crew would pull on property to do the work for that week all of the hair on thier neck and arms would stand up. He said there is a ton of energy on that property and it is haunted.